I'm talking REAL hot, y'all. It's the intensity of Texas heat, except it's DRY heat and the sun feels like it is literally ten feet from your face. 100+ degrees. No shade ((okay, I'm exaggerating)). No rain. Please, Lord send some rain. I'm just thankful God shut that summer camp director door a while ago and I'm not working outside ;) Anywho, I was too lazy hot to take photos outside. You get these photos instead, of the great indoors. 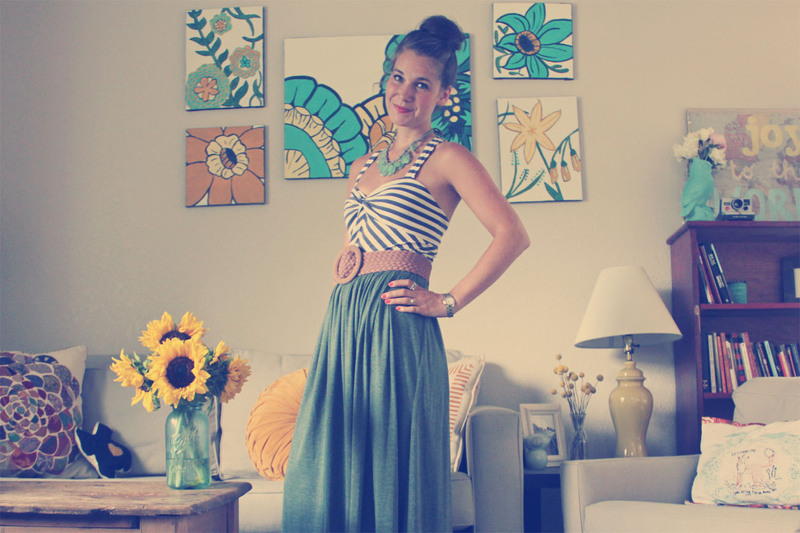 This maxi skirt, as mentioned above, is from Stacy Lynn's shop on etsy. It is SO comfortable, fit's me perrrrrfectly and hides those unshaved legs. heh. Check her shop out if you need more maxi love in your life. aw this top is so adorable, i really love how you styled it with the maxi skirt, it looks great! and i love the necklace as well, you have such wonderful style! and your house looks adorable, those paintings behind you are awesome!! I love this outfit! I think it might be one of my favorites! That top just looks great on you! so purdy! 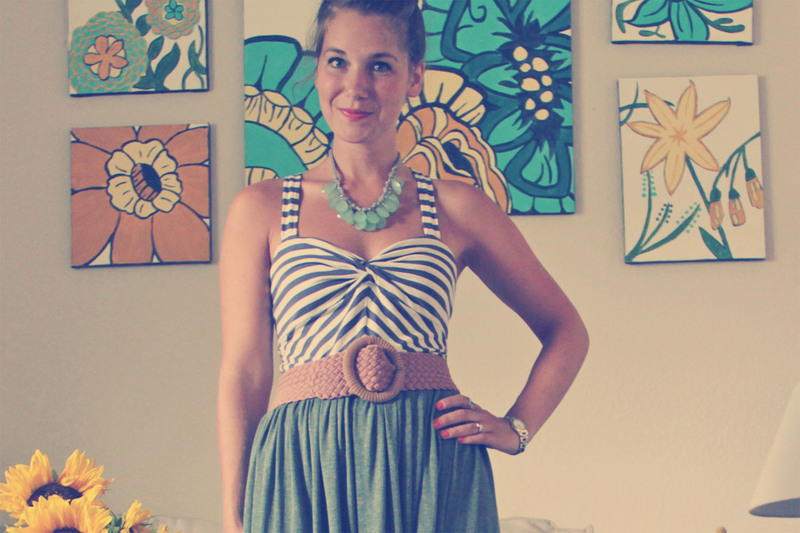 i am ALL about maxis this summer :) and yours is rockin! I love your outfit! You look lovely. Oh, it's HOT in Houston, that's for sure. And, as a Camp Director, it's...HOT. But I do spend a lot of time inside answering e-mails, doing paperwork and talking to angry parents/misbehaving kids, so not as hot as it could be. It's also TOTALLY worth it (especially when you carry around a nalgene full of ice water!). You sure melt beautifully! I didn't know what to do with myself with I visited Texas in the summer–it's nothing short of miserable! Your outfit is so perfect for summer. Looks lovely. This outfit is amazing! I absolutely adore everything about it...the top, the necklace, the belt. And your backdrop is incredible. What room is this? I love that artwork and the gorgeous sunflowers! I just love this outfit. Amazing! LADY, you are way too cute! i'm feeling ya- it's hot here too! this outfit is so cute! You are so darn cute! I am so glad one day I stumbled upon your blog! so cute! found your blog through pleated poppy, and love it! you look SO classy and timeless. Love it. I love this dress on you, and you probably have your hair up because of the heat, but it really suits you and the whole look!